Do you know why we end up paying more for a flight ticket than your co-passengers? It’s not because we don’t know the best tricks to snag a cheap ticket, it’s because we don’t avoid making some mistakes that cause us expensive airfares. So, how to avoid them? Simple, by recognizing them! Here we have listed some of the most common mistakes that must be evaded while making flight bookings. They say that booking in advance saves money - provided you don’t book your flights too early. Airlines publish their fares approximately 11 months in advance and travel deals (all claiming to be the best) start popping up on your social media news feeds, emails, phones, and a lot many other places. However, you should only start looking from flight fares around two to three months in advance when the flight tickets are actually reasonably priced. Are you too afraid of being bombarded with spams and junk mails? Let us tell you that not all emails that happen in your inbox or even junk mails are absurd. Some of them may have a decent deal worth hundreds of dollars. 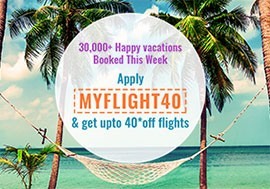 Instead of spending hours in front of your computer looking for cheap flight deals, you can easily scroll down your inbox and spot offers and discounts. Also, newsletters are one of the primary mediums through which airlines and OTAs notify their subscribers of their deals. Do you check airfares to and from alternate airports when searching for cheap flight tickets? Do it. It can save you some serious money. Oftentimes, flying to a smaller airport near a major airport costs less. Cover the distance from your home to an alternate airport near your origin airport and distance to your destination from your landing destination by road and save more on airfares.